I promised you something very cool tonight.... here it is. Two very talented customers have shared their beautiful flower punch art with us. The first is Angie from Australia. I've posted some of Angie's work here back in January, but it's worth repeating! Here are some new pieces she has created. Angie creates a matching box for all her cards. As you can see in the above, the box helps showcase and protect all the meticulous work. Here are a few more cards... all gorgeous of course. These 3 cards were made with the Bookatrix embossig board. Lisa from Kentucky also shares this talent. Here are her recent entries in the county fair, and as you can see blue ribbons all around!!! Receiving blue ribbons means that she can now enter these items in the State fair! Good luck Lisa! You deserve to win for sure!!! 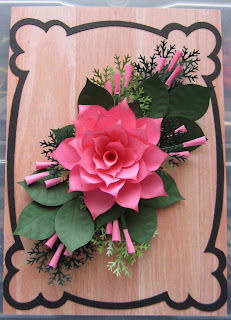 I hope seeing these beautiful projects will inspire you to try your hand at paper flowers. I'd like to recommend a great book. It's called Paper Bouquet and you can find it on my website at http://www.franticstamper.com/punchartbooks.htm. I feel like it's been ages since I posted something! Well, that's because it has. It's not entirely my fault though.... you see, blogger decided I was a spammer (how they got that idea, I don't know). But anyways, they BLOCKED my account and for 3 months, I've been trying and trying to get it unblocked! Lo and behold, today it **IS** unblocked!!! YOOHOO!!!! I can post again!! 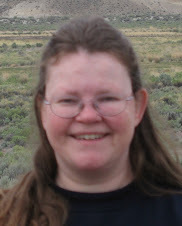 This morning, I learned of the passing of one of my dearest friends, Barbara Holl. 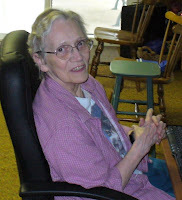 I have had the pleasure of knowing Barbara for over 10 years. I first met her online through a rubberstamping group. She became a customer, and about 10 years ago, I was fortunate enough to actually meet her in person. I will always remember the day I met her. My friend Kathy and I were preparing for the Puyallup rubber stamp convention. It was our first time in Washington and we had reserved a certain hotel because it was inexpensive. When we got there, the place was a flea-ridden dive. We decided to check out right away, go to the convention center and set up our booth and worry about a hotel later. Barbara was there helping someone else set up their booth and offered to help us with ours. When we told her about our hotel situation, she offered her home to us. She insisted we stay with her as she had 2 spare bedrooms. Mind you, she didn't know us from Adam! Barbara was always the most giving and caring person. We stayed with her and her husband Frank in their lovely Tacoma home, just minutes from the convention center. They fed us, looked after us and we were grateful. From then on, twice a year, Kathy and I traveled to Washington for conventions and stayed with Frank and Barbara. They always has warm beds and warm meals waiting for us. Barbara enjoyed so many hand crafts. She love cross-stitching, card making, making plastic canvas boxes and teaching all the wonderful techniques she learned. In the years of knowing Barbara, we learned she was a grade school teacher before retiring, a military wife who lived in Germany and Hawaii, and a wonderful mother. She loved wolves, teddy bears, cats, the Seattle Seahawks and Mariners, nature, art, and all things of beauty. She also loved sharing everything she had and everything she knew. When I stopped doing conventions, she always asked me to come up for a visit to rest up and relax. Kathy and I took her up on the offer 3 years ago. We spent an entire weekend in our pajamas making cards and admiring her albums full of creations. She was so talented. Since then, she asked me numerous times to come up for another weekend, but I was always "too busy". Now I regret not taking the time to go visit. I will never again have the pleasure to spend time with her. For all of you who knew Barbara, you know exatly what I mean. Barbara was a vibrant lady, always full of laughs, smiles and energy. We will all miss her greatly. Knowing Barbara, I know she would have never wanted anyone to cry for her, fuss for her, or feel sorry for her. Her family has asked that no flowers be sent, but donations be made to the Leukemia and Lymphoma Society in her memory. (http://www.lls.org/hm_lls). Barbara is survived by her husband Frank, her son Rick and her daughter Joyce. If you would like to send cards to Frank (he is a dear dear man, the dearest man ever! ), please send them to me at: 186 Ayres St, Eagle Point, OR 97524, and I will forward them on to him. LITTLE DAVIS: -Again, same as above…. Cloud 9, Heidi Grace and Little Davis are all owed by Fiskars now. They had mosly clear stamps in the Little Davis brand and I purchased ALLLLLLL of them!!! Watch out wallets!! INQUE BOUTIQUE: -More stamps…. Some rubber, some clear. Lots and lots of stamps! Lots and lots of great priced stamps!!! AUTUMN LEAVES: -I just concentrated on their new clear stamps. Ran out of money and didn’t buy their new papers. Truthfully, they didn’t do much for me… LOL!! But their stamps are wonderful so that’s what I went with. DESIGN ORIGINALS: -A couple of new books for scrapbookers, paper crafters, and digital scrapbooking too. CRAFTER’S WORKSHOP: -More templates!!! 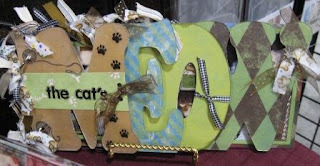 Crafter’s Workshop has really carved out a niche for themselves with their fabulous templates. I believe there are 12 new templates coming each in 2 sizes. DOODLEBUG: -It’s all about the flocking!! Flocking kits, flocked paper, flocked brads. 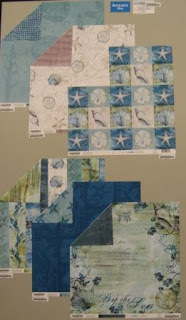 In the past, I have not carried Doodlebug’s papers, but we are adding their new lines!!! Watch for these in late March. FANCY PANTS: -with 6 new collections, there’s something for everyone. Fancy Pants’ style is one of a kind. You won’t want to miss these! SCENIC ROUTE: -Another great new selection of papers! AROUND THE BLOCK: -New tool: The Paper Gator!!!! This is an exciting new tool. It’s a corner rounder, but it can punch through multiple sheets of cardstock, chipboard, cork, etc. here will be 4 different blades. 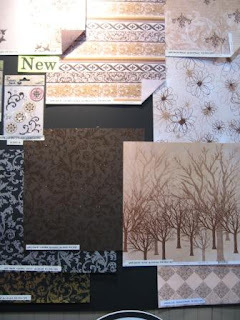 Of course there’s more, including papers, funky embellishments, new frame tapes (paper lace) and so much more!! SPELLBINDERS: -We were able to preview the Xcalibur, a motorized die cut machine. This will be exciting when it comes out in the late summer. Sadly, it’s not quite ready for release so we were unable to put in an order. We really don’t have a firm price either. But, there are new dies coming for the Wizard!!! RANGER: -Adirondack Pigment inks!! You’ve seen these on my site already. They’ll be here in April. BAZZILL: -New BLING colors, new chipboard, and I also picked up the “Destinations” colors introduced last year. OCTOBER AFTERNOON: -This is another company for which I had a lot of requests. Of course, I picked up the entire line. ZUTTER: -A new tool from Zutter is the corner rounder. Much like Around The Block’s Paper Gator but a little more portable. We of course re-stocked on Bind-it-Alls. Don’t forget that you can punch through acrylic with the Bind-it-All….. perfect for making your own clear albums! Also, by popular demand, we will soon have the “stop guide” accossory as well as 3 NEW colors of wires: baby blue, baby pink, and antique brass! WORLDWIN: -Just a few unusal texture cardstocks…. Pearlized with a finish. I didn’t buy much from them, but had requests for these specialized cardstock, so went ahead with a small order. WE R MEMORY KEEPERS: -The Crop-A-Dile II “big bite” was a huge hit at the show. BUTTONS GALORE: -We’ll be switching the bags of buttons we currently get from Dara over to Button Galore’s because the range of colors is MUCH better. Big bags of buttons for $6.99 in beautiful colors! These should be here next week. LITTLE YELLOW BICYCLE: -3 fun lines from this offshoot of C-Thru (the ruler people). If you haven’t seen the ads in the magazines yet, get ready! CLEAR SCRAPS: -Acrylic albums --- we already carry most of their line of clear albums: dog bone, house, tabbed albums, etc…. and now, we’re adding all the new ones: words, farmhouse, car, and more! 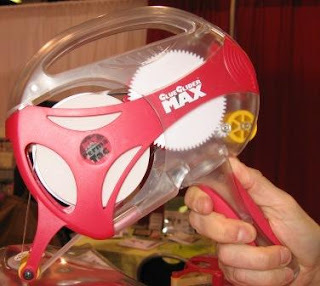 GLUE ARTS: -Always on the cutting edge with new adhesive answers, Glue Arts introduced this very handy tape runner, the "GlueMax". The cartridges come PRE-filled, so you just snap them in an out. No more threading the tape through. 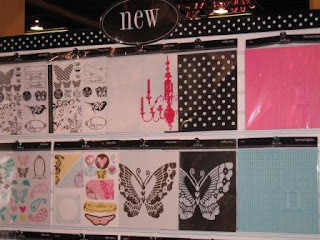 ECSTASY CRAFTS: -Lots of Dutch templates, decoupage papers, new books, new peel off stickers…. TOGA: -This company from France was not actually exhibiting at the show, but as you know my “French Connections” are numerous, LOL, and I was able to meet with the owner of the company who showed me some fabulous versatile templates. These templates are like nothing else I have seen here and I’m very excited to bring them in for you. Whew!!! I got back from CHA on Wednesday evening (more like NIGHT, LOL!!) Of course, there were lots of emails and orders waiting for me when I got home. I’m just now sitting down collecting my thoughts. -Definitely the most exciting product I saw/played with/bought – The Slice!!! This is the same little die cut machine we saw at CHA last year, but this time it REALLY is coming. Making Memories is producing it (Tinnus licensed the Slice to Making Memories). This cute little hand-held die cut machine is going to be one of our best sellers for sure. If you go to http://www.makingmemories.com/ there is a picture of it on the home page. No further info there yet… but stay tuned. Quickly, I will tell you a little about it. Email me for more detailed info (franticstamper@charter.net). This die cut machine takes little cartridges (which are very inexpensive). Each shape/letter on the cartridge can be sized from ½” to 4”. The Slice weighs about 4 lbs, works with the power cord or on the rechargeable battery, so it’s VERY portable (great for crops or traveling). See a video demo here: http://youtube.com/watch?v=snj8Kp20OtQ (note: the yellow slice you see in the video is a prototype… the real one will be the blue one you see on the Making Memories site). The starter kit is $149.99 and include the machine, a design card, a 6x6 cutting mat, 5 blades, the blade replacement tool, the tacky adhisive and the power cord. Additional design cartridges will be $39.99. The Slice will be available in July. -They introduced 5 new lines at the show. You can go to their site at http://www.basicgrey.com/ to see them. I’ll be adding them to my site shortly as we should see all of these in the beginning of March. I love the Sultry line and I think that one is going to go fast. Ditto for the Archaic. -I always love their stuff!! I’m especially fond of their word chipboard albums. Not to disappoint, they came out with new words as well as some great paper lines, including an expantion of their popular double dot line. -I was fortunate enough to get invited to a little party they put on for their good customers. It was nice to relax in a big room full of other store owners and watch their presentation. 5 beautiful new lines (my favorite is the Valentine one…. It came out earlier this year, but I waited to buy it at the show). They also introduced chipboard word albums much like Bo Bunny’s but in other words: Father, Mother, Happy, etc. -As usual, more great flowers! But also, they had “Clear paintables” which was their version of acetate overlays. The trick is they showed a neat technique where you can color them with Sharpie or Copic markers. I suppose you can do that on any overlay, not just theirs…. But it was cool to see! I also ordered a lot of products they introduced at the Memory Trends trade show, and those items are already here. I will be updating the website this weekend. All their new releases will come later in March and April. -Heidi never fails to come out with cute new stuff. Overlays, stickers, papers, yum yum yum. -New chipboard!!! Yes!! Also a new stamp storage binder made of faux leather that you can PAINT with the adirondack dabbers to customize it for YOU. Lots of great collage “trinkets” also coming, as well as new rubber stamps that are all Tim style! -EK revamped all their lines of Jolee’s stickers… but I bought so much at the show, that I didn’t have any money left for new stickers. However, they are coming out with great punches, including BIGGER sizes of popular shapes (bigger than the Whale of a Punch). Look for those in the coming months. -K&Co. has merged with EK Success’ parent company. This makes it easy for me to order. J I’ll soon be discontinuing all my current K&Co. inventory as it’s very old (I haven’t bought any new stuff from them in a couple of years) – but look for NEW products including papers, stickers and embellishments. They have some gorgeous lines! -Another company that merged under the EK umbrella…. So this is a new one for me. Great clear stamps! They also have wood mounted stamps, but due to a lack of space, we stuck with buying just their clear stamp line. I’ve got some of everything coming. A small portion will be here in the next week or so, and the rest will be coming in about a month. -Oh my! This was one of my biggest purchases for sure. 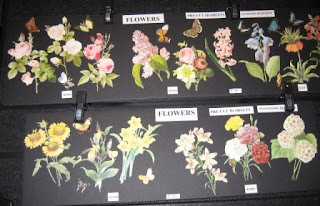 Lots of great overlays, papers, epoxy stickers, chipboard books, rhinestones and brads etc… --- themes such as beach, travel, froggies, Asian fusion, floral and more. I also picked up most of the Narratives line of beautiful die cut papers. -You know Maya Road is one of my favorite companies, so I had to get all their new stuff, of course!!! If you are a fan of their chipboards, wait til you see the new Cat and Dog keychain chipboards, the house chipboards are the best, and of course there’s more. We were one of the first orders, so our shipment will come first. They are releasing things in 3 installments: March, April and May. Can’t wait for all these items!! -Best Creations is known for their beautiful glitter papers. We have all their new ones coming! 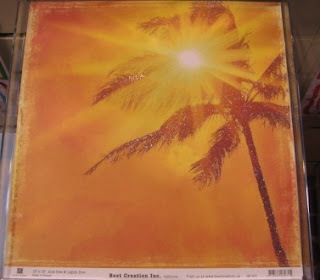 I must say, the sunset palm one is one of my favorite papers I saw at the show. New stickers here as well. -I’ve had a lot of requests for Rusty Pickle, so I bit the bullet and opened an account with them. I purchased most of their new collections, as well as a few of their older ones. -12 new colors of Radiant Rain daubers are coming!! I don’t have the list of colors yet, but they should be here in 2 weeks. As soon as they are available, I will let you all know. -2 words “Dark Vanilla”. I’ve never heard of this company before, but their papers really really caught my eye…. Especially the “Dark Vanilla” line. But even more exciting than the beautiful papers was the Dew Drops! I’ve been looking for these ever since one of our customers asked if we could get them. Dew Drops are little cabushon beads of epoxy that you can use to embellish your pages, cards, stamped images, etc. -OH MY! New punches, new tools, new new new! My favorite is the new border/corner punches that make a frame or tiles. They were demoing these and I forgot to take a picture!!! Trust me, everyone will want these!!! -This is a company owned by Fiskars… Much like Cloud 9 (see below), they are more geared to the traditional scrapbook look/feel than Fiskars which is all about the tools. Heidi Grace has papers, stickers, brads, etc. We bought EVERYTHING new. -Same as above…. EVERYTHING!!! It’s all coming!!! Just a quick hello. It's been 2 weeks since my last post... just too busy! It's a good thing, LOL!! Thank you for the wonderful sample, Angie! Once again, I've slacked off on updating the blog..... just not enough time! LOL!! So I'll make it up to you with a beautiful card. I did not create this... again, not time. This was made by Marlou Hol of the Netherlands using punches she purchased from my site. Thank you Marlou!!! Your work is beautiful!! !